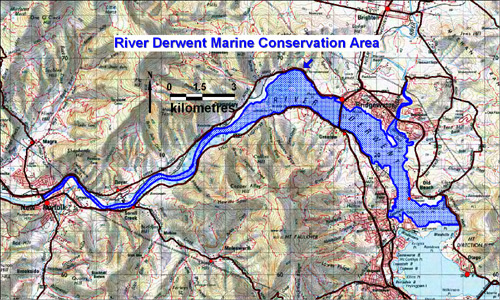 The River Derwent Marine Conservation Area encompasses 1,636 hectares within the River Derwent between New Norfolk in the west and Dogshear Point (in the vicinity of Claremont) in the east. The reserve contains a diversity of different habitats and large areas of wetlands of high conservation value. Ecosystems within the reserve play a key role in the maintenance of essential ecological processes within the Derwent estuary. The reserve contains significant areas of seagrass habitat, including aggregations of the macrophyte Ruppia, which play an important role in nutrient cycling and primary production. The microscopic algae and bacteria that live in tidal flat sediments provide important ecological benefits, including removal of nutrients and organic matter, whilst the wetlands filter out sediments, nutrients and other pollutants. Salt marshes in the area contain a unique assemblage of succulents and other salt-tolerant plants. The reserve area contains habitat for a number of threatened species, including the seastar (Marginaster littoralis), and the Australian grayling (Prototroctes maraena). The reserve provides habitat for migratory wading birds, black swans, native ducks, crabs, pippis, platypus, frogs, snakes, fish, and a diversity of invertebrates. The area also contains important habitat including feeding, breeding and rest areas for whitebait and sharks. The reserve contains a large portion of the 'Lower Derwent River Estuarine Delta and Flood Plains' - a unique Tasmanian geoconservation site located between Bridgewater and New Norfolk. The delta and flood plains consists of an estuarine delta, mud flats, low levees, peats, swamps and alluvial flats, indicating extensive infilling over the last 6000 years. It is arguably one of the best developed sites of its type in Tasmania. The reserve area in the River Derwent was first proclaimed a "sanctuary with respect to black swans" on 4 March 1920 under the Animals and Birds Protection Act 1919. In 1941 the original proclamation was revoked and replaced with a new proclamation under the Animals and Birds Protection Act 1928 declaring the area a "sanctuary for birds generally". The motivation for changing the proclamation was to protect all birds in the reserve particularly native ducks which were being hunted in the reserve. On 9 December 2009, the old reserve described by the outdated description was revoked and the new River Derwent Marine Conservation Area reserve was proclaimed in its place under the Nature Conservation Act 2002. The new reserve all but overlaps the old reserve area except for a few minor boundary adjustments, and is described more accurately by an up to date Central Plan Register Plan. The reserve class of conservation area provides for the protection and maintenance of the natural and cultural values of the area and the sustainable use of natural resources.